October has been a busy month! But seriously, at this point that probably doesn’t count as surprising news if you’ve been following along. We started the month off with a fun trip to Louisiana for my brother’s wedding – I was a bridesmaid, Madeline was the flower girl, and the boys passed out programs to the guests as they arrived at the church (they looked super sharp in their little suits). Since then, it seems like we’ve had sporting event after sporting event between Kendall wrapping up the cross country season, Logan with flag football, Kayden with soccer, and Madeline finishing up her last week of rock climbing. Kevin and I had a little overnight trip close by while the kids were gone for the weekend, he had a super busy work week with a few late nights, we attended a military ball, and had the walk through on our house. The whole month flew by in the blink of an eye, which is great because I’ve been literally counting down the days until our house is complete (we close on Halloween!!). I cannot wait to start moving in next week and to start the decorating process. The other thing on the calendar for the month was celebrating Kevin’s birthday. I was super excited to make it special for him because it was going to be his first birthday since we’ve been married. Also because we’ve been so busy with so much going on the last few months, plus we’ve kind of gotten into this weird limbo-rut while living in our rental house. It is surprising and not surprising at the same time how different life feels (for us anyway) when you are living somewhere temporary that you know isn’t your space, especially when most of your belongings are in storage. I wanted to make sure had a fun evening and that it wasn’t just the same dinner, homework, showers, bedtime, wash, rinse, repeat that the past couple months have been. We are super lucky and have Kevin’s parents and his sister and her kids living really close by to us, so I planned to have everyone over for the celebrations. Just like I do with the kids, I asked him what he wanted for his birthday dinner. I wasn’t surprised at all with the answer and honestly, I probably could have decided that myself without his input: grilled steaks for dinner and Chocolate Chip Cookies for dessert. It has been absolutely gorgeous this fall. We still have plenty of days in the 70’s and even low 80’s so I thought grilling was perfect for that day. To go along with the steaks, Kevin’s mom brought a cheesy potato casserole everyone likes, I grilled asparagus and onions, baked a batch of Kale Chips (everyone in the house loves them, kids included), made this Roasted Salsa Verde Hummus and sliced up some baguette to serve along side the hummus for dipping. 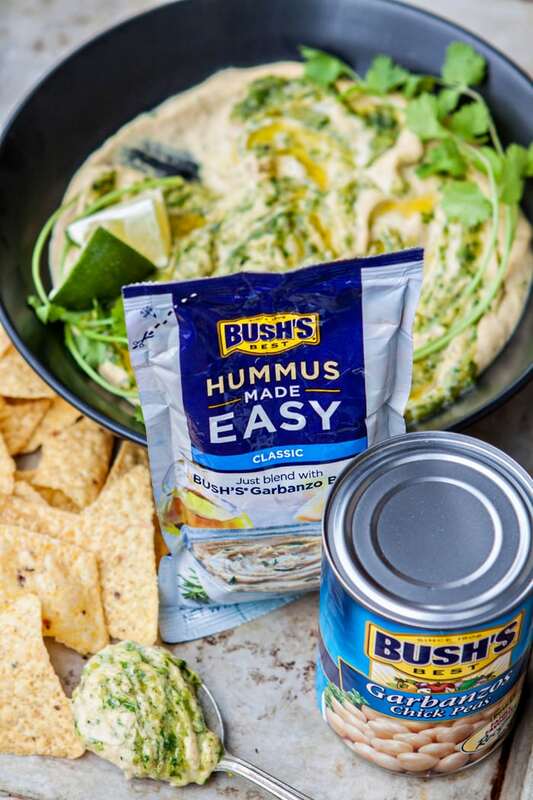 If you haven’t seen Bush’s® new Hummus Made Easy, you need to check it out next time you’re at the grocery store (it will be located on the bean aisle). It comes in three different flavors: Classic, Roasted Red Pepper and Southwest Black Bean. I can’t tell you how many times I’ve told myself I’ll make hummus for a snack to have on hand at home and then forget that I don’t have all the ingredients, or I decide I don’t want to deal with measuring, etc. This new Hummus Made Easy makes preparing hummus at home so incredibly easy – only 3 steps. First, you’ll rinse and drain 1 can of beans, then add the beans with a pouch to a blender or food processor, and puree. You can stop there if you want, because the pouches contain all of the traditional hummus ingredients (like olive oil, tahini, and spices) and it is great since they’re all simple ingredients but with plenty of flavor. 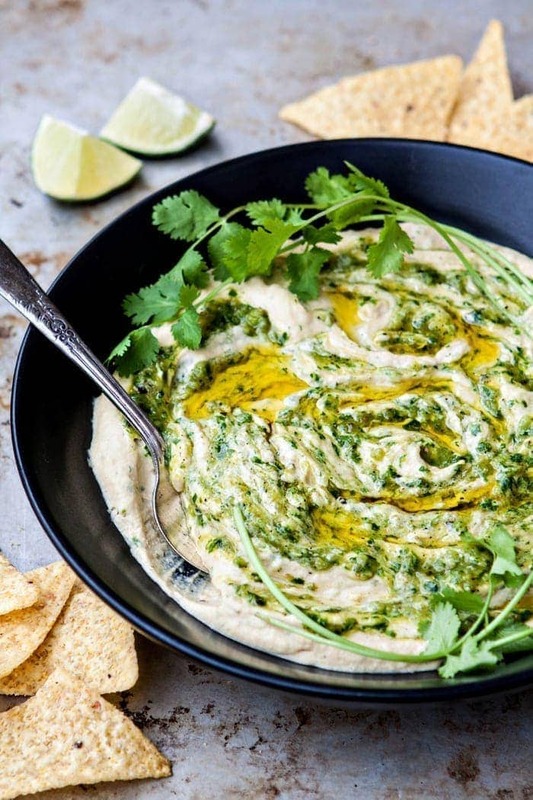 Or, if you want to dress your hummus up a bit, like I did with this Roasted Salsa Verde Hummus, you can add fun mix-ins and other personal touches. I roasted some peppers and a tomatillo and blended that up with cilantro and a bit of onion. I mixed some of that easy roasted salsa verde into the hummus and then swirled the rest through the top and drizzled with a bit of olive oil. It made it really stand out visually with the bright pops of green! If you want to customize your hummus, try a few of these mix in ideas to give your hummus variety and flavor. Bush’s® also has lots of ideas to Create and Customize Hummus if you need extra ideas. 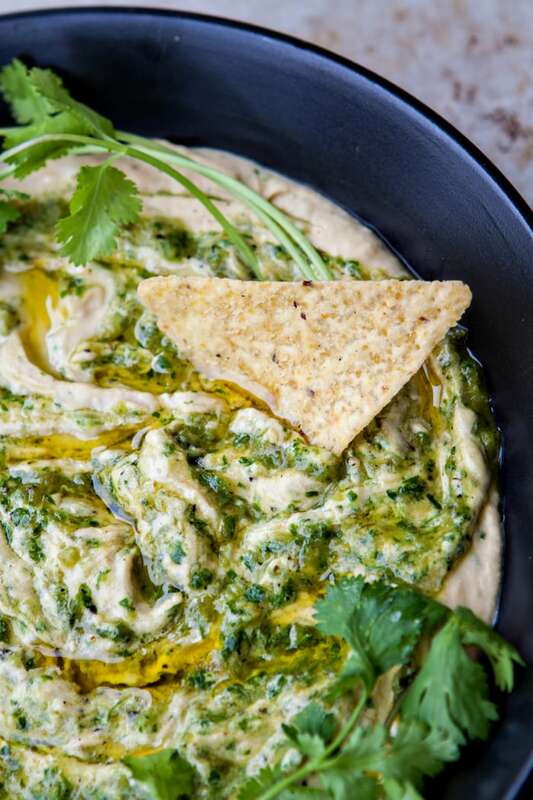 Hummus is a great all purpose dip that pairs well with many different accompaniments. Think of the accompaniments as a medium to getting the hummus into your mouth. It can also be used as a spread. 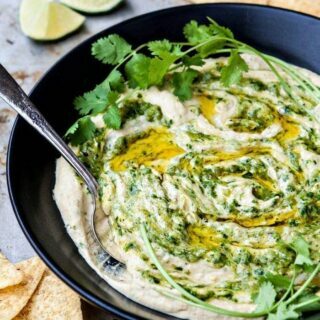 We served the Roasted Salsa Verde Hummus with thin sliced toasted baguette, but it would also be great paired with Baked Cumin Chipotle Lime Tortillia Chips. Hummus Made Easy was great to prepare an easy, yet not boring, appetizer to put on the table to have before the meal. Kevin’s mom, especially, loved it and I think it made the birthday dinner just a little extra special to have lots of different flavors that complemented the grilled steak that Kevin requested. 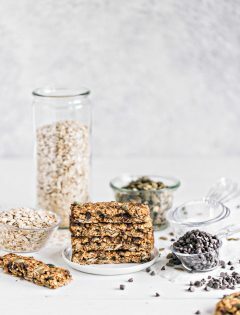 Plus, the little bit of leftovers made for a great healthy snack the next day. Like I said before, October has been a busy month. But looking back it has been full with so many great things, and we’re certainly ending it on an exciting note – with a birthday celebration and closing on a brand new house! The next time I photograph a recipe to share here I will have most likely prepared it in our new house. 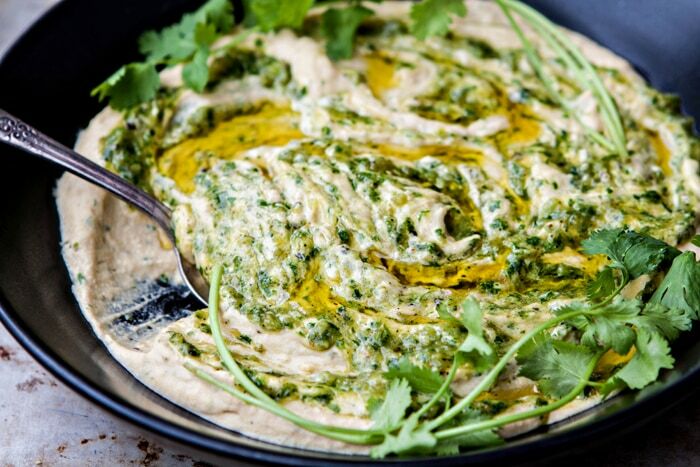 What are your favorite ways to prepare and serve hummus? Place poblano, jalapeno, and tomatillo on a baking sheet. Roast in the oven, with no oil, at 450 degrees F for 20 minutes, or until they have browned and are tender. Place all of the roasted ingredients in a food processor or blender along with the cilantro leaves and lime juice. Puree until smooth. Season to taste with salt and pepper. Set aside in a bowl. Add the drained and rinsed Bush's® Garbanzo Beans, the Bush's® Classic Hummus Made Easy pouch, and 2 tablespoons of the prepared roasted salsa verde to a blender or food processor. Puree until smooth. Transfer the prepared hummus to a bowl. Add the remaining salsa verde on top of the hummus and swirl it into the hummus using a butter knife. Drizzle the top with olive oil. Serve with a variety of items for dipping and scooping, such as grape tomatoes, radishes, carrots, celery, sliced and toasted baguette, and tortilla chips. I love Bush’s® Beans and am incredibly privileged to have working relationship with them here on Good Life Eats. 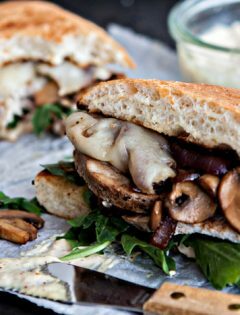 I’ve been compensated for my time in creating this recipe and post, but as always – my opinions are my own! Hi! 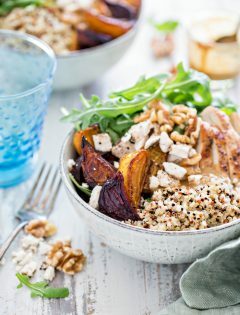 It looks delicious and very healthy! YUM! My hubs has been obsessing over salsa verde lately! He is gonna LOVE this! Salsa verde is the best! Oh my gosh this looks incredibly delicious!!! Katie this looks absolutely amazing!! 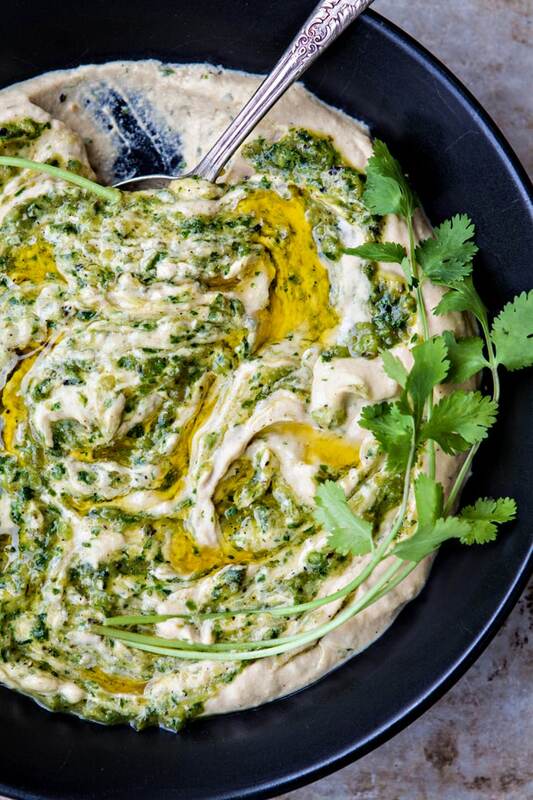 I love salsa verde, genius to combine it with hummus. Gosh, Katie…this looks amazing! I want some now!